Blitzkrieg embark on their latest European tour this September starting in their Hometown of Newcastle on September 7th and working their way through Germany, Switzerland, Italy and France. It is the band’s only tour this year and interest is high. Everyone of course knows Blitzkrieg for Metallica covering their self titles 1981 anthem but the band have picked up many fans through their own albums; from their first, Time of Changes in 1984, to the latest release, Back From Hell, which saw top marks in all the major European and world wide press. Blitzkrieg, fronted by Brian Ross who is also vocalist for his other cult metal act Satan, feature longtime guitarist Ken Johnson and now Brian’s son Alan,on 2nd guitar . 09.09.14 – DE – Hamburg – Bambi Galore! 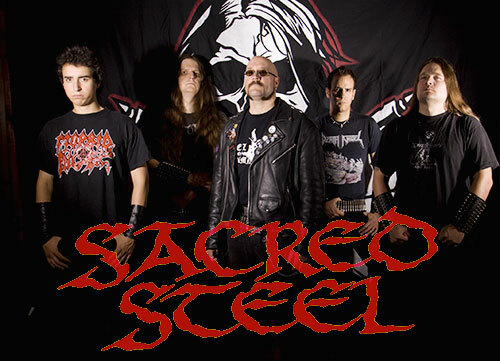 SACRED STEEL will be soon back on the road in Europe to continue support their Cruz del Sur Release “The Bloodshed Summoning”. So far, the band has announced the following tourdates in Germany, Austria and Spain. KING DUDE on Tour !! Main support will be announced shortly. Visit www.voodoosix.com for all the latest news! ENFORCER – announce first ever headlining tour! Swedish high-energy Heavy/Speed Metal outlet ENFORCER are proud to announce their first ever European headlining tour which will see the Stockholm based foursome hit the road in 2014. After presenting their current record »Death By Fire« the audiences of the “Hunting Across Europe” Tour alongside label- and country mates GRAND MAGUS and British Metal veterans ANGEL WITCH in early 2013, the aspiring act has moved up to the next level. Joining ENFORCER on the road will be Canadian Metalheads SKULL FIST and Dutch Hard Rock assault VANDERBUYST. SONATA ARCTICA are currently about to finalize the recordings of their upcoming, yet untitled new studio album, which is scheduled to be released in march 2014. On their homepage, Henrik “Henkka” Klingenberg gives regular updates about the recording process. “We’re very pleased with the results and I’m sure you’ll be too”, Henkka added in his latest post.